Apple this week initiated a new service program that grants free, out of warranty repairs to Apple Watch Series 2 owners whose device suffers from a swollen battery or refuses to turn on. Apple stores and Authorized Repair Providers were informed of the policy change in a note distributed through the company's internal GSX portal on Friday, reports MacRumors. According to the document, "some" Apple Watch Series 2 models will not power on or exhibit swollen batteries "under certain conditions." An exact description of minimum requirements for eligibility was not included, but Apple is offering free repairs to those devices found to fall under the criteria after a physical examination. The program is limited to 42mm Apple Watch Series 2 variants, suggesting the same battery issues are not as prevalent on 38mm models. Repairs are available to owners for a period of up to three years after purchase, even if the device is not covered by Apple's add-on warranty. Notification of the new repair policy was sent to service providers in the United States, Canada, Mexico and Europe, suggesting the initiative is a worldwide effort. Apple has not issued an official statement on the matter, nor is the program listed on the company's Exchange and Repair Extension Programs webpage. AppleInsider has reached out to Apple for comment. 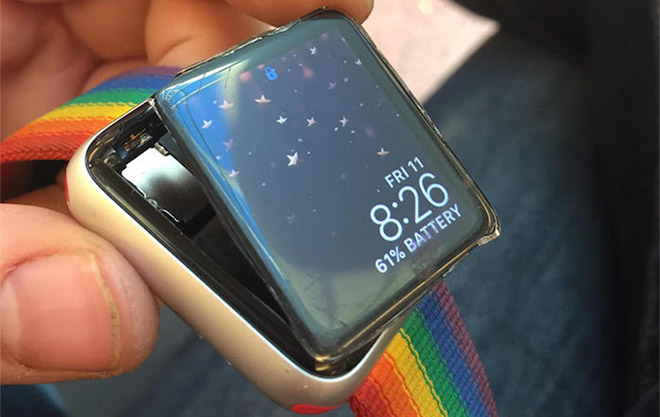 Apple Watch users have for years complained of expanded, or swollen, batteries across multiple device generations. Like most lithium-ion battery packs, the pouches used to power Apple Watch are susceptible to swelling and expanding when punctured, overcharged, overheated or otherwise damaged. While not a widespread issue, battery swelling can cause power interruptions, operational issues or, in some cases, dislodged displays. 2) and other online forums. Public reports also confirm issues in which the device refuses to power on. The new repair program mirrors a warranty update for first-generation Apple Watch models implemented last year. At the time, Apple extended its standard one-year limited coverage by two years to account for devices suffering from swollen batteries.